May 5, 2006. 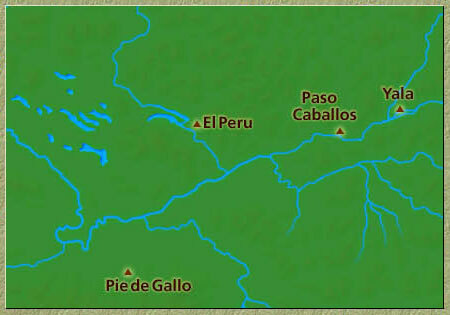 Southern Methodist University (SMU) has reported the discovery of another royal tomb at the site of El Peru-Waka' (map). The find was made by Dr. Hector Escobedo, co-director of the Waka' Archaeological Project, and his student, Juan Carlos Melendez, of the Universidad de San Carlos de Guatemala. The tomb was discovered on April 28 beneath the principal pyramid at the site. Although its roof collapsed, the tomb is said to be in good condition and dates to between the second and fourth centuries A.D. According to the LA Times, the tomb holds the remains of a single individual who was apparently laid out on top of a jaguar pelt on a stone bench. Among the associated jade objects was a "jester god" symbol of royalty. Photo: Daniel LeClair, Reuters The Times reports that yet another royal tomb was found on April 30 and had not yet been opened as of May 4. Outside this tomb, dating to some four centuries later, was a large cache of figurines. As reported by National Geographic News, the figurines of "ballplayers, elegant women, dwarfs, and seated lords hint at the supposed occupant's royal status." The caption to a photograph posted by National Geographic refers to the April 28 find, indicating that the tomb was discovered when archaeologist Hector Escobedo fell through the floor of a tunnel that he was excavating. "We are trying to identify the remains, which appear to be in good condition despite the collapse of the tomb's roof. This may be the resting place of either the dynasty founder, a man we do not have a history for, or K'inich B'alam the First, the Maya king who allied with Siyaj Ka'k', conqueror of Tikal in A.D. 378." Given the time span to which the tomb is dated, there must be other candidates as well. As first noted by David Stuart (2000), Siyaj K'ak's name is recorded on Stela 15 at El Peru, associated with a date only eight days prior to his arrival at Tikal. Little is known of El Peru's earlier history.